If you’re planning on living in a van full time then you’ll come across a winter. Perhaps you’re wondering “can you live in a camper in the winter?” Well, the answers yes and unless you live somewhere that’s hot all year round that means you’re going to have to think about how to live in a van in winter. Ideally, you’d think about this before you even convert it, but if you didn’t then there are still a few things you can do to make it a bit warmer in your camper van home. When we bought Elvis is was the middle of winter in Toronto, Ontario. It was COLD, especially for two people used to the relatively mild climate of the UK. We had to figure out how to keep a camper warm in the winter fast! We spent a few weeks converting our sleeper van, Elvis, into our new home in a Home Depot carpark and battled through a couple of snowstorms in doing so. Since our plan was to travel through the US and then up to Vancouver, BC and use Elvis for ski trips, we knew straight away that we needed to have some good insulation if we were ever going to survive winter in a van. 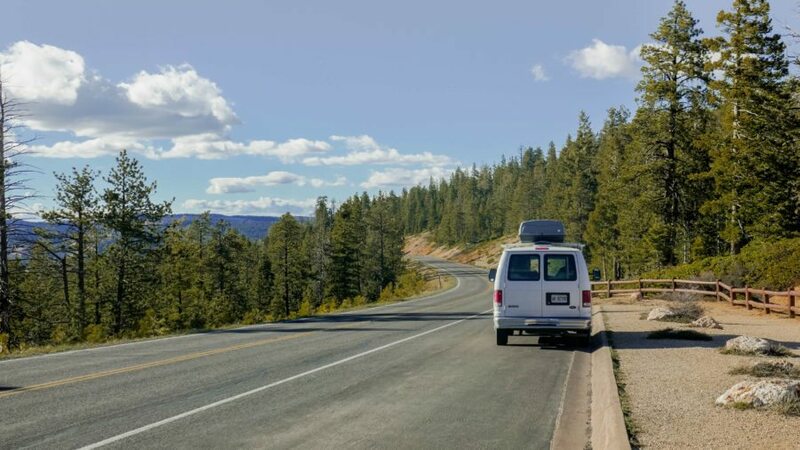 Van life in Canada isn’t easy, especially in the winter but we manage thanks to the below camper van tips. We love using our van for ski road trips and winter camping and have spent nights at -25°C perfectly comfortably (if not a little chilly when we get out of our bed!). 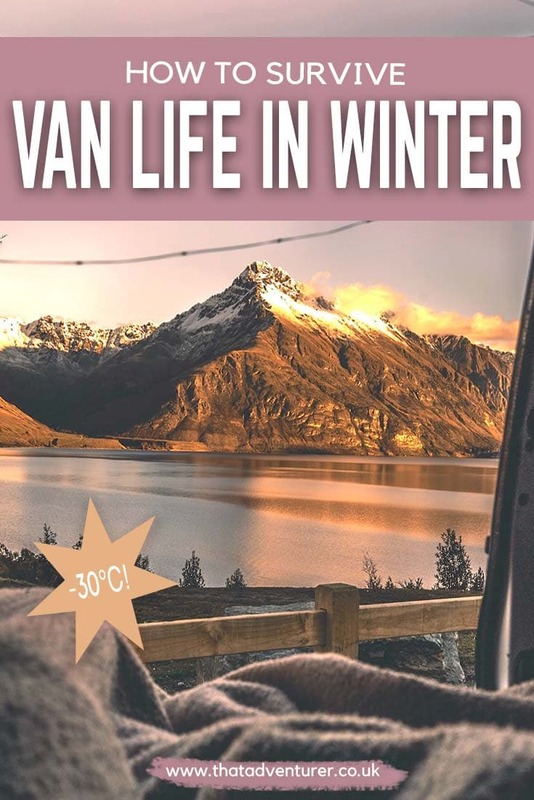 Here are a few of the van life tips and tricks we use for camper van life in winter. 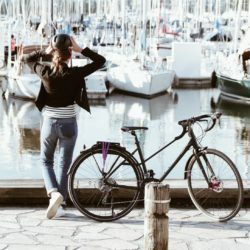 These van living tips should be useful for anyone looking for how to live in your car in the winter too but I imagine that’s absolutely freezing! Elvis after – loads of insulation behind the ceiling, walls & floor! 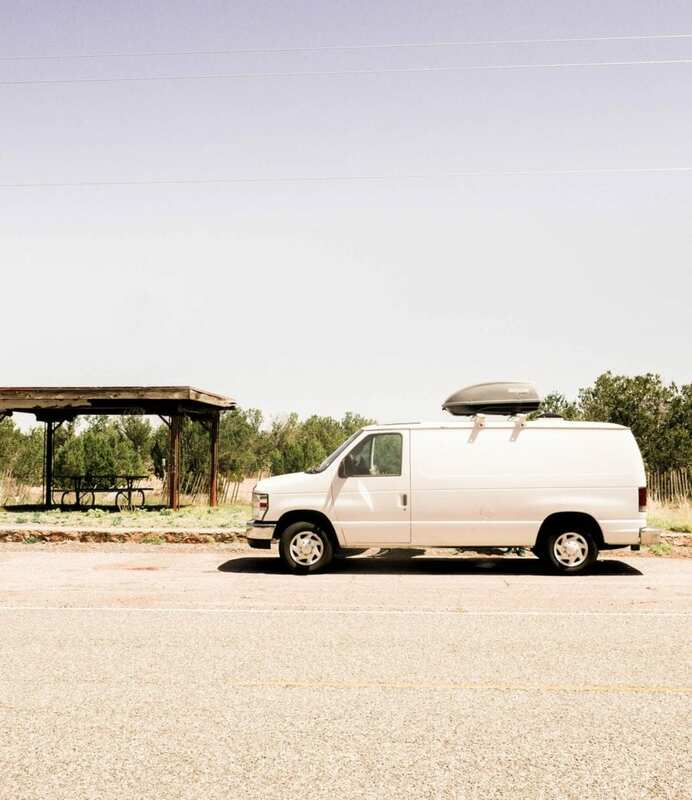 Van insulation is one of the most important things you can do. We went all out with the insulation during our van life conversion to make sure that Elvis retained plenty of heat (and also a little bit of soundproofing as a bonus!). There’s no one single best insulation for campervans but everyone has their own opinions on it. This is one job that you need to do before converting your van into a camper van if you plan on living in a van in the winter. We used a combination of foam boards (perhaps the best van insulation), reflectix, spray foam and fibreglass wrapped in bags to avoid it spreading everywhere to insulate our van for winter camping. For our campervan insulation, we insulated the roof, the floor, the wheel wells, the sides and the doors by stuffing fibreglass into the holes in the doors and filling any gaps with spray foam. 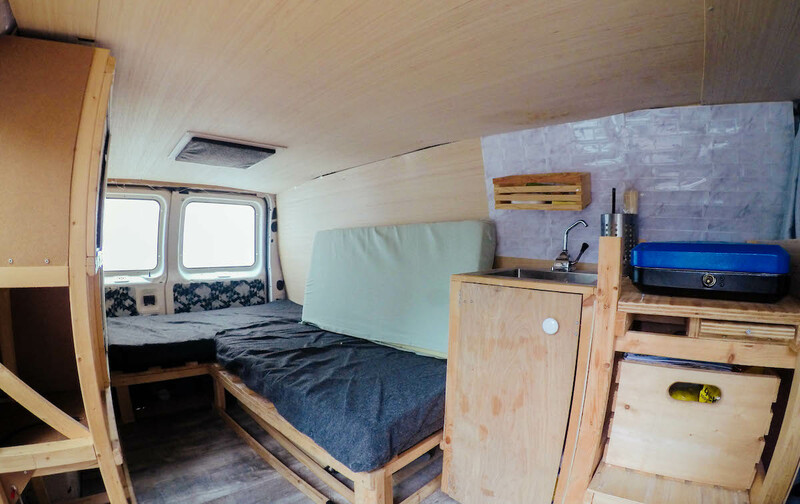 Out of everything we did during our van conversion for vanlife, the van conversion insulation stage probably took the longest but honestly, I think it was so worth it for us. If you want to know more see this post on how to insulate a van. It’s not the only way to do it, but it seems to have worked for us and it’s a good place to get a general idea of how to insulate a camper for winter use. If your van has windows then you’ll also need to insulate them, plus there’s the added benefit of blocking out any prying eyes. If you’ve done any research into how to insulate windows from cold then you’ll have probably come across reflectix. 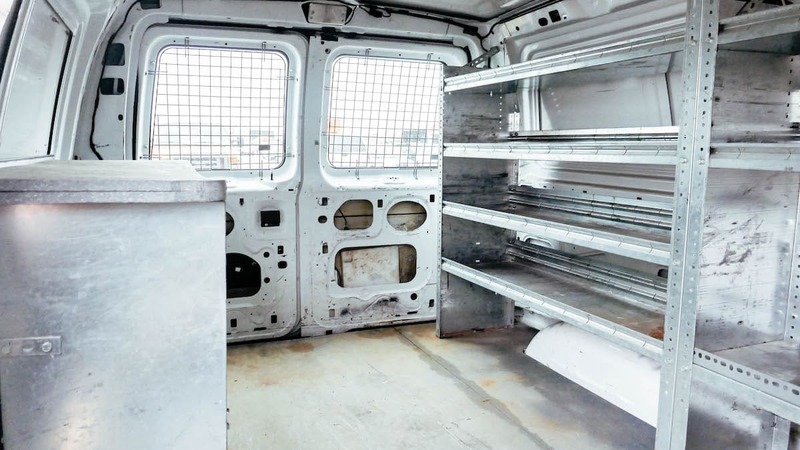 It’s the most commonly used method for stopping heat from escaping through the windows and it’s something I’d never heard of before we began our van conversion project. Reflectix is a flexible type of reflective insulation and works better in windows than it does on your van walls. If your van is warm (perhaps you’ve been driving before you go to bed and had the heaters on), then the reflectix on your windows will reflect this heat back into the van rather than it just disappearing. We cut out reflectix for all our windows, including the front windscreen although we only really use that one in winter as the van is warm enough in summer without! 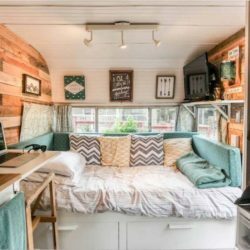 If you want to personalise yours and make it look a little homier than some silver bubble wrap, take a look at this post on how to make your campervan feel like home. Still unsure about how to live in a camper in the winter? Here’s something that’s a GREAT help! You’ll hear a lot of vanlifers talking about when it comes to heating a campervan in winter is their Mr Heater Buddy. It’s the best way to stay warm for those of you looking at how to heat a camper without electricity. I even include it in my van life essentials post. It’s a super popular camper heater and you’ll want to get a hold of one if you’re doing some winter van life stints. As with any campervan gas heater and, since this heater runs on propane, you can’t leave it on for long and most definitely NOT overnight! However, it works great for providing a blast of heat before you go to bed, and again in the morning when you wake up. We use our van heater just to take the chill out of the air and it worked great when we took a trip to the wineries in the Okanagan with friends and needed some heat while talking outside in the middle of a fire ban! It’s a great winter camping heater and is reasonably economical on gas usage too. For us, it’s one of the best heaters for campervans out there. Whether you’ve insulated your van or not, you’re going to want a great sleeping bag, duvet and blanket combo. We got through a cold Toronto and New York State winter with plenty of snow with Ikea’s warmest duvet. We then upgraded this for our skiing trip in eastern BC when we were living out of a van to include a sleeping bag and a blanket on just to make sure we were extra warm. Temperatures plummeted to below -25°C on some nights so this trio was more than welcome! We have a double sleeping bag that is rated to -3°C. Yes, it’s not the warmest but with the duvet and blanket, it’s usually warm enough. I love a hot water bottle even when it’s not that cold, they just make things cosy! If you’re living on the road in winter, then a hot water bottle is going to be very much appreciated. They’re the safest and one of the most effective van night heaters out there. On the coldest nights, I like to fill mine up just before getting into bed and then snuggling up with it. If you don’t already have a water bottle you can also use a Nalgene water bottle as a hot water bottle! Just make sure the water isn’t quite boiling as then it’ll be far too hot. Put it at the end of your sleeping bag to keep your toes nice and warm overnight if you wish. When you’re living in a camper in the winter you’re not going to want to skimp on clothes no matter how good your insulation work is. Thermals will be your new best friend when living in a conversion van in winter! Merino Wool layers are popular for good reason, they work, however, they are pretty expensive. 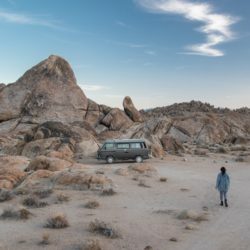 If you already have some thermals then start with them and the other tips for vanlife in winter on this list. If you’re still too cold it may be time to invest in some merino wool base layers. Smartwool and Icebreaker are among the best. Before we embarked on my Canada move, my sister got me these great big slipper socks that I wore most nights while sleeping in our van. They’re super comfy and, most importantly, super warm – would highly recommend. You’ll also want a hat and a nice thick fleece or sweater too for living in a camper in winter! If you’ve installed a solar panel and a goal zero, or have an RV with a generator, then a 12v electric blanket might be an option for you – talk about luxury! Just because it’s 12v don’t plug it into the cigarette lighter in your van. If you do you’ll likely wake up with a flat battery in the morning! An electric blanket also shouldn’t be left on overnight. Not only will it drain all your power but it’s dangerous too. Therefore, make sure you get one with a timer or automatic switch off like this one. We didn’t have an electric blanket while we lived in our camper over winter but it sounds like such a nice idea.